I love this photo of Claudia and Mischa. Taken after the ceremony by their friend, Jesse, it really catches the romantic feel of the day. This beautiful setting was Claudia and Mischa’s own back yard! 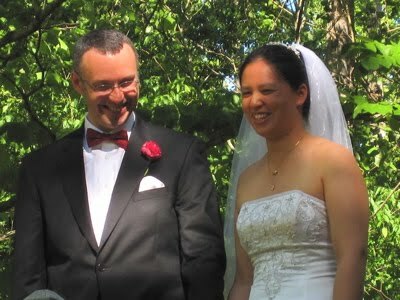 Their wedding was a long time coming and, with Mischa’s Austrian-German heritage (growing up in Austria) and Claudia’s Malaysian-Chinese heritage (growing up in the United States), their love story is multi-cultural, multi-continental and romantic to the core. A true fairy tale come true. 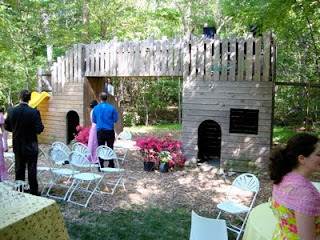 They have a lovely home and decided it would make a perfect setting for the casual, friendly wedding they had in mind. 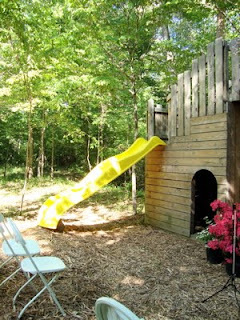 As luck would have it, the previous owners of their home had built a play castle for their children and it had remained when they moved. Claudia and Mischa decided it would be fun to have their wedding atop the castle and what a unique and clever idea it was! Before we began, Claudia’s sister, Frances, a multi-talented classical musician, played the prelude music on the cello. 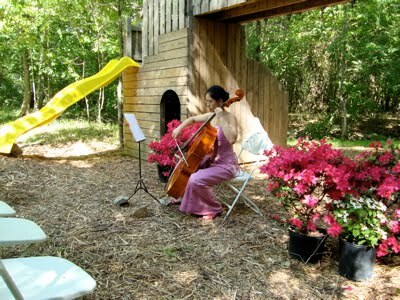 That beautiful sound, with the notes wafting through the trees, was mesmerizing in that idyllic setting. Two readers also contributed to the ceremony, joining us on the castle, and here is a photo of Chad reading, “A Fairy Tale Potion for a Modern Day Wedding,” which was most appropriate for this fairy tale love. and slid one after the other down the slide. What a fun recessional and so perfect for them! Inside the house, everything was set up for a special reception. 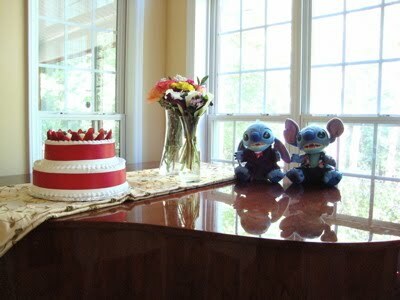 On top of the piano (Claudia is also a classical musician), the cake was set up beside a couple of Stitch dolls, dressed for the occasion. Why Stitch? I wondered that myself. It turns out that Claudia and Frances had these dolls from childhood and Frances has made them clothes over the years. 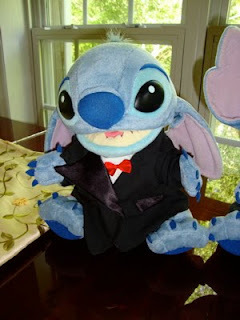 Note that Claudia’s Stitch is dressed in a tux and red bow tie to match Mischa’s. 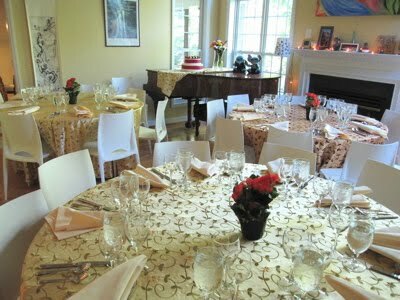 It was important to Claudia and Mischa that they include their heritages and in the end they decided to showcase them with the food they served and the music played for the ceremony. Great choices all the way around. For the cake they decided to go with Claudia’s Chinese heritage, using red for good luck and including the traditional Double Happiness symbol on the top. Exquisite. 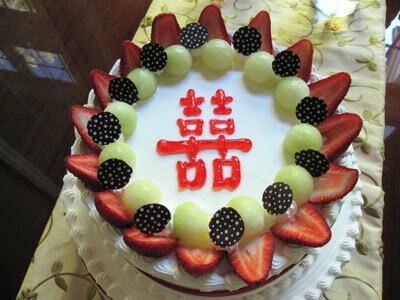 This beautiful creation was provided by Chanelle Bakery (inside the Grand Asia Market in Cary) and Claudia told me it was every bit as delicious as it looked. 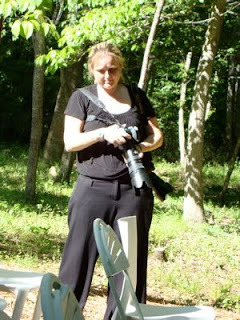 The wonderful photographer on hand for the day was Penny Noell of Penny Noell Photography. I love her work and can’t wait to see her photos of the wedding when they are online. 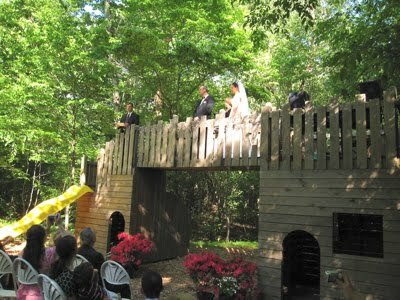 Here she is scouting out the best location for optimal shots of the wedding atop the castle. Update (11/4/12): Claudia’s sister, Frances, was married to Robert on October 20, 2012 and I was so happy to be the minister at their wedding as well. Here is a link to the blog post about their special day.